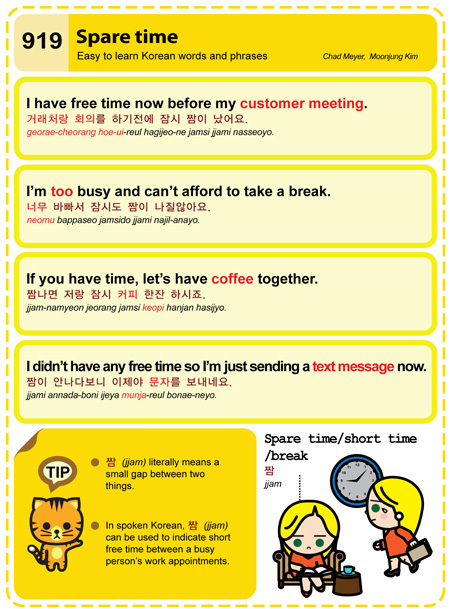 Easy to Learn Korean 919 – Spare Time. This entry was posted in Series and tagged break, coffee, customer meeting, free time, jjam, short time, spare time, text message, too busy, 거래처랑 회의를 하기전에 잠시 짬이 났어요, 너무 바빠서 잠시도 짬이 나질않아요, 짬, 짬나면 저랑 잠시 커피 한잔 하시죠, 짬이 안나다보니 이제야 문자를 보내네요 by easykorean. Bookmark the permalink.